Maxine Waters is probably the face of all those who have gone off the deep end with the election of Donald Trump. While the Democrats might have some legitimate concerns over the Comey notes people like Maxine Waters do not help the cause with crazy conspiracy theories like this. She made the accusation today that Vladmir Putin was responsible for Donald Trump naming Hillary Clinton “crooked Hillary” and that stated the Russian President was behind the “lock her up” chants. When asked if she had any evidence to back up this claim she admitted she had none. She was just irresponsibly throwing this accusation out there hoping it would stick. This goes well beyond having a reasonable discussion on Donald Trump’s alleged ties to Russia in fact I think it hurts the cause because of the credibility issues she is creating. This should be classified as racist. MSNBC Morning Joe has Waters on the program because they are using her. Her role is that of a stereotypical ignorant black women who is good for a few laughs. The reporter tries to avoid any eye contact with Waters, so he won’t start laughing. The MSM has long ago crossed over from journalism to entertainment. These programs should be avoided at all cost. Maybe they are using her for a few laughs because they know she has become unhinged, but I don’t think it has anything to do with race. The pawns only do as they’re told. Getting to the real sources behind the ‘Agenda’ would be even better! Finding the den and doing what needs to be done with them. Can’t get much better for a spokesperson for the Dems unless its Fauxahontas. Her face wasn’t that pleasant seeing first thing in the lovely, sunny morning Steve! TAL! 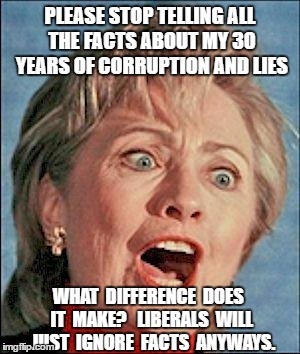 She’s the definition of crooked so she should know! Her mouth may’ve been smaller, until the blow bag affect took over, or she was that way from birth, who knows.These kind are unappealing to the eyes & ears. The devil’s children are very busy these days for sure, still beguiling the masses ~ just ask polluted no evidence Waters. …’Ye shall surely believe what we tell you to believe …’ Ha! Stop the Lying-Serpent’s-Ugly-Wicked People Campaign! That pic sums it all up! … and not one left wing looney is embarassed.